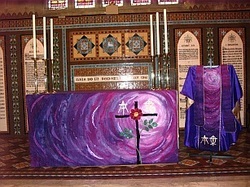 The four altar sets consist of an altar frontal, chasuble and stole. They are in the four liturgical colours of white, green, purple and red. They were created by Jan Clark, an internationally-renowned textile artist. They all have a small symbol of Mary. This is the nine blue tiles, echoing the existing decoration of the Church interior and the Greek word Theotokos, which means ‘God Bearer’ and is a symbolic name for Mary. White symbolises purity, holiness, joy, innocence and triumph. It is used in the seasons of glory – Christmas and Easter and other high points of the Anglican Church year. Jesus said ‘I am the light of the world’ and this frontal represents that light spreading across the earth. 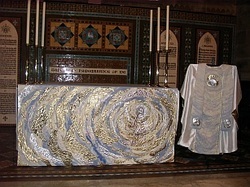 Gold and silver and the symbolic blues of Mary swirl around the focal point of the altar frontal – the figure of Jesus. The season of green is one of life, hope and growth. This is represented by the young eucalypt growing towards the light of God. This symbol is presented at the front of the Chasuble and Stole. The seasons of Advent and Lent, of quietness and penitence, are symbolised by the colour purple and the Greek letters alpha and omega, the beginning and the end. The flowering Cross represents hope and the rose is another symbol of Mary. The Chasuble and Stole have the alpha and omega front. Red is used particularly at Pentecost. 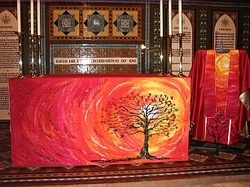 Flames symbolise the gift of the Holy Spirit descending on the Apostles. The flame tree has been used in this context. 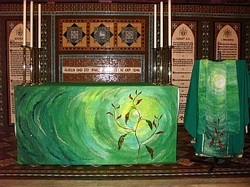 The tree image is also used on the front hem of the Chasuble and on the Stole. The altar sets were given by the Davies family, the Nyquist family, St Mary’s Anglican Women and the Priests and people of the Parish of Maitland.